Slimbridge Horse Show was well attended and blessed with warm sunshine on Saturday 25th July, so we erected our gazebo and set out our stall in anticipation of a good day. We were still glowing from our recent airing on BBC Radio Gloucestershire the preceding Monday and Tuesday, 20th and 21st July, when Faye Hatcher had interviewed our publicist, Trish Mills, and Chairman, Peter Golding. 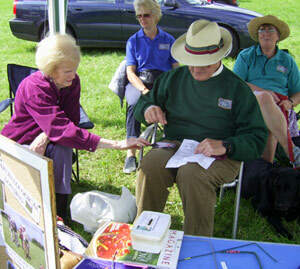 Indeed, some visitors to our stall confirmed they had heard our interviews and enjoyed them, so they already knew a little more about dowsing than they had previously. a photograph Peter works from several checklists - skeleton, nervous system, endocrine system, etc. With an eye on the photograph of the the cat, and holding his pendulum in one hand, Peter ran a free finger down each checklist. It wasn’t long before he announced, ”Pancreas.” The lady looked startled, then beamed. ”Yes!” she said incredulously. ”That’s right.” Peter then sent the cat absent healing.